Was away form the market since mid of last week. 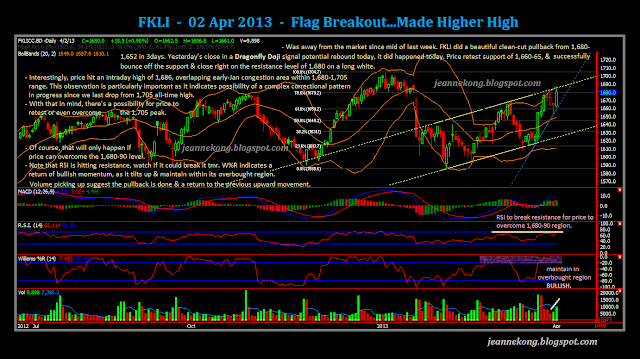 Both FKLI & FCPO dropped in the past few days. 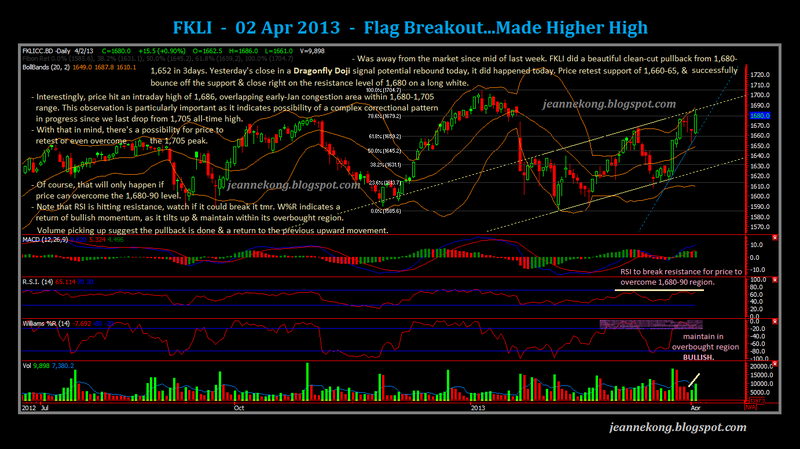 Last week, FKLI hit intraday high of 1,680 & pullback sharply to 1,652 low within 2-3days. However, yesterday (Apr 01) saw a sharp midday rebound sending price to close near day high, forming a Dragonfly Doji on the daily. Following the bullish candlestick pattern, today saw price bounces off the 1,660-65 support band & climb steadily up throughout the day, past the 1,680 resistance to hit a day high of 1,686, before a quick pullback in the last few minutes of trade, to close at 1,680. The intraday high past 1,680 level has overlapped previous congestion area of 1,680-1,705 back in early Jan. This increases the probability of a retest of higher levels at 1,690, or 1,705 peak, as we might be in a complex correctional pattern as we correct from the all-time high of 1,705. Or, maybe we are still in a LT uptrend (from 1,295 major pivot low) & the correction from 1,705 high to 1,585 low was a mere pullback of the uptrend?? Whatever it is, let's take it step by step, follow closely behind the market while it shows us where it intends to go. Past few trading days saw CPO opened gap-down for three consecutive days, sending price down from 2,467-2,335 within a few days time. On Mar28 night, a bearish USDA report indicating a build on inventories sent grains futures plunging, that might have help accelerated the decline on CPO, as SoyOil, inevitably, got dragged down by the sell off on grains. Most have recoup parts of their respective drop by end of last week. Price staged a rebound from latest low of 2,335, closed the day sitting above the ST downtrend line defining the drop from 2,505-2,335. The rebound was supported by volume & momentum, too. Now that price is back above strong support of 2,360, overhead resistance to clear will be at 2,395-2,405 | 2,415-25 | 2,440-50. 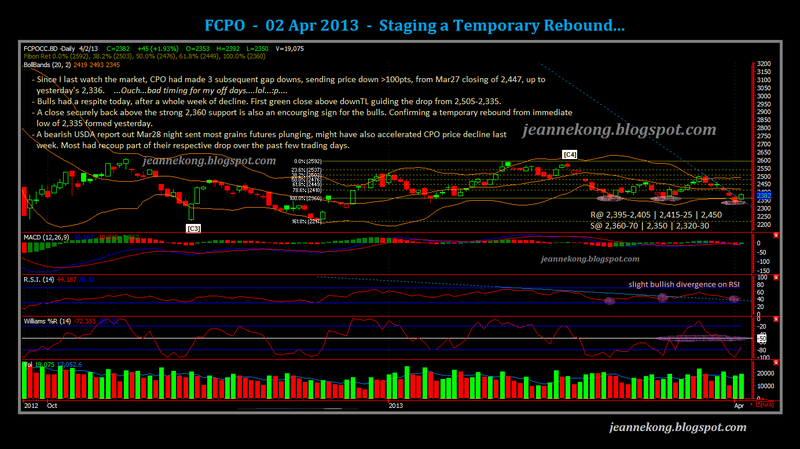 Support will be at 2,360-70 | 2,330 | 2,305-15. Meanwhile, on SoyOil, price is still largely in sideways mode between 49.50-50.50. After failing the 50.50 support level following the Mar28 decline. Price has now fallen back into the daily down-channels, looking a little weak as it continues to stay below 50.50 S-turned-R level. Strong support to watch will be 49.40 & 49.00 levels. Strong resistance remains at 50.00 & 50.30-.50 levels.